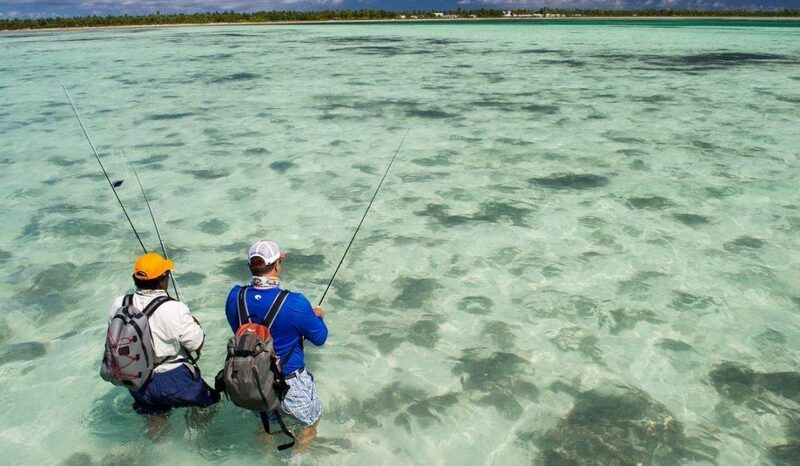 For many years, we have proudly partnered with Yellow Dog Fly Fishing Adventures to assist us with all our travel needs, as they are renowned in the fly fishing industry as the leading experts in Fly Fishing Destination Travel. Yellow Dog is the premier name in fly fishing travel and we're excited to feature one of their unique, exciting destination each month. This month, we're featuring the one and only Christmas Island. Many anglers, including everyone of us in the shop, dreams of catching those Christmas Island GTs! Yellow Dog has provided us with all the details. If you have any questions about your fly fishing trip to Christmas Ilsand or would like inquire about another fly fishing destination, simply inquire with us (shop@troutsflyfishing.com or 1.877.464.0034) and we'll get you in touch with the Yellow Dog Fly Fishing representative that is an expert on your desired location, and will be able to assist you with the entire trip booking process. Dining/Accommodations: There are two different lodging options on Christmas Island. The Villages offers several small cabins outfitted to accommodate two anglers per room. Each cabin is equipped with air-conditioning, hot showers, and comfy beds. Breakfast at The Villages consists of homemade toast, eggs, and bacon. Lunch is sandwiches with snacks, fruit, and drinks. Dinner is a variety of dishes including local fish, rice, chicken, pork, pasta, and salads with a homemade dessert to top everything off. The second option for lodging is Ikari House. All of Ikari House’s double occupancy rooms are equipped with their own private bathrooms with good water pressure, comfortable single beds, and A/C units. While this is not an upscale lodge, it’s a very comfortable base of operations for fishing this remote coral atoll. Breakfast at the Ikari House consists of toast, eggs, bacon, and a variety of fruits. During breakfast, a table consisting of lunch items will be provided for anglers to make their own lunches. Dinners are prepared with local fish, rice, chicken, pork, pastas, salads, and to top everything off, homemade dessert. Travel Details: There is only one flight per week to Christmas Island/Kiritimati Island’s Cassidy International Airport (CXI) on Fiji Air, which departs from Honolulu International Airport (HNL) every Tuesday morning. That means that you must fly to Oahu on Monday at the latest (we suggest Sunday to allow for any delays, since there is only one flight per week to Christmas Island/Kiritimati Island) in order to make the Tuesday morning Fiji Airlines flight to Christmas Island Airport. You will overnight in Honolulu and the flight to Christmas Island is around three and a half hours. On arrival, you will pass through customs and take the half hour van ride to the lodge. You then depart Christmas Island the following Tuesday and make a connecting flight home from Honolulu.